After a slumber of 12 millennia, the Demon Empire returns to seize control of the Earth. Raideen, the giant robot-like protector of the lost continent of Mu, senses the evil presence and awakens within its golden pyramid, revealing to young Japanese boy Akira Hibiki that he is the one descendant of the ancient Mu people who must help Raideen save Earth. The first release has a very soft head which can be easily removed and stretched with heat. Many of the first release figures are found with stretched head sections. As with the other initial release Shoguns, the first release has the wheel trucks molded into the feet, rather than screwed on. The first release bird-plane (called a delta wing in the instructions) is made of a softer blown-plastic than the later versions (which are molded hard plastic), and they are not interchangeable (later release delta wings will not fit on the pin mechanism in the early version chest. I've been told of a variation that has a bow on the shooting fist rather than an axe. The only first boxed versions that I've seen have had axes, so this is unsubstantiated (the fist could have come from a Japanese or other foreign version released through asian markets in the US). The shield-fist on the first version is held together with a single rivet, instead of screws found in the later versions. The second release tightened up the head mold with less pointy edges and harder plastic. As previously noted, the wheel trucks are now attached with screws, the delta wing is made of a harder plastic and the shield is held together with screws instead of rivets. 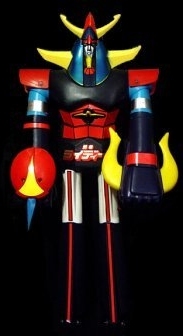 The third release further simplified the figure by removing the red plastic epaulets. The rib-area is simplified so that fewer decals are needed. The box reflects the changes in the "fist-shooting" inset in the lower right front (no epaulets) and also on the sides. 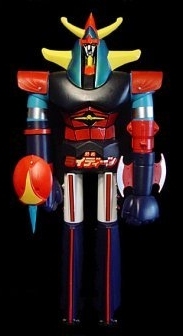 CONTENTS: RAYDEEN warrior 23 1/2" tall, with flying iron-cutter fist, 5 delta wing missiles and accessories. Arms are detachable. Winged missiles not for use with all Shogun Warriors.